"Imani, a young Masai girl, may be short in stature, but what she lacks in height, she more than makes up for in courage and determination, traits that help her rise above—both literally and figuratively—the cruel taunts of the village children. Despite the tale’s specific geography, narrator Boafo seems to draw on the softly rounded accents and lilting cadences of her Ghanaian background to create a rich sense of an African culture. She expertly captures the varied emotions of the characters, from the harsh voices of the village children to the self-doubt of tiny Imani to the gentle encouragement of the little girl’s mother. In addition, she hisses an entirely satisfying sssnake, chatters like a scolding chimpanzee, and lends mystery to the hooting of an owl. A well-produced package (marred only by a few overly long silences where page-turn signals have been edited out on the listen-along side) is rounded out by occasional background music and sound effects: drums, laughter, and indigenous animal noises. The multicultural setting as well as the anti-bullying subtext mean this will find a ready audience in early childhood curricula." "Even with the village children’s taunts ringing in her ears, Imani is determined to believe in her personal dream: to touch the moon. After many tries, Imani is inspired by her tribe’s traditional jumping dance, the adumu. Brown-Wood here gives listeners a beautiful tribute to the power of a child’s vision, interwoven with folklore and tradition. Imani’s resolute persistence and her mother’s unwavering faith in her child is a story of spirit and confidence that significantly culminates in Imani, herself, becoming the storyteller. Maame Yaa Boafo’s brilliant narration is sparkling with life. Hazel Mitchell’s watercolor illustrations expertly mirror the gentle souls of Imani and her mother. The author’s note provides context for the story as well as Brown-Wood’s motivation. VERDICT This story affirms the power of perseverance and should be shared with all young students." MaameYaa Boafo's rich, warm voice entices youngsters to listen in on the attempts of diminutive Imani to touch the moon. Inspired by a bedtime story about Olapa, the Maasai goddess of the moon, and by her mother's advice, Imani is determined to "do something great." Boafo sets a leisurely pace and has a self-assured storyteller's lilt and cadence. 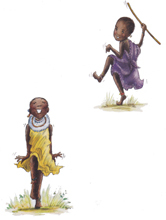 She stretches out words as Imani attempts to climb a tree to the moon, mimics the teasing of village children, richly coos as Imani's mother, voices the chimpanzee's staccato amazement, and bursts aloud joyfully with Imani's success. Sound effects of Imani's village provide scene-enhancing background. The author concludes the production with her thoughts on the inspiration for the story.